A CRACK IN the Antarctic Larsen C ice shelf has seen a significant development in size since January. If the ice shelf splits away, it will be one of the biggest icebergs ever seen. Researchers have estimated that the iceberg could be more than 5000 square km (Galway is a little larger – at 6,149 square km). There is no concern that Larsen C’s breakup will contribute to a significant sea level rise. Ice shelves are already sitting on top of water. However, if the iceberg begins to thin out when it breaks away, somewhat of a rise will be evident. Scientists have been studying the shelf by satellites and through other techniques. Yesterday, they released an update showing that the crack grew 17km between 25 May and 31 May. Now, the rift tip has just 13km to go before it breaks free into the Southern Ocean. The crack is currently approximately 110 km long. “There appears to be very little to prevent the iceberg from breaking away completely,” the researchers wrote. 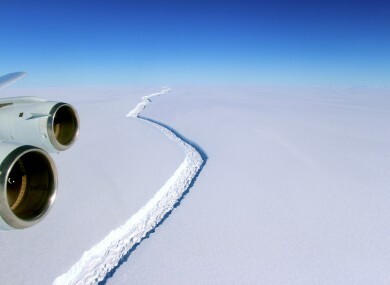 The researchers also indicated that the crack has turned towards the front of the ice shelf and the ocean, “indicating that time of calving is probably very close”. “When it calves, the Larsen C Ice Shelf will lose more than 10% of its area to leave the ice front at its most retreated position ever recorded; this event will fundamentally change the landscape of the Antarctic Peninsula,” the researchers wrote. An ice shelf is a thick floating platform of ice that forms where a glacier or ice sheet flows down a coastline and onto the ocean surface. The MIDAS Project is continuing to monitor the development of the rift and assess its ongoing impact on the ice shelf. Researchers at Project MIDAS from Swansea University and Aberystwyth University conducted the study. Email “Iceberg as big as Galway on the brink of breaking away into ocean”. Feedback on “Iceberg as big as Galway on the brink of breaking away into ocean”.